Japan: No Big Trucks For You! Edmunds reports: Report: Toyota, Nissan Shelve Heavy-Duty Truck Plans...For Now. What's this mean? And why are we reporting on trucks? It's interesting, however, to see Japan hold off on moving into deeper truck waters while Detroit flounders around as the pond drains. Is Japan trying to first make sure its smaller (i.e. 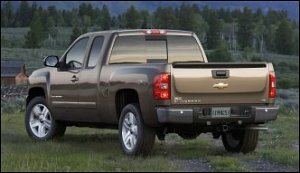 half-ton) trucks are solid (Tundra, Titan)? Or is Japan not entering the market because it's going to soon be too small to justify? Meanwhile, here's a snap of the Silverado. Why? It's better looking than the Tundra—what a beast. Autoblog reports: Honda exec: No Tundra-fighter for US. We don't have a whole lot to say about this, but we did want to mention this kind of decision illustrates the difference between the car companies. We don't mean Detroit Vs Others, we mean from car company to car company. Toyota, for example, is in every market segment created: car (small, medium, and large), truck (smallmedium, large), SUV (medium and large) and luxury (expensive and more expensive). Honda, on the other hand, has been pretty mellow about all of this. We were pretty disappointed Honda decided to build the Ridgeline, but it seems to be a pretty good truck for what it is meant to be. Anyway, we think it is smart for Honda to stay out of the big truck segment. AutoWeek reports: The Piezo Effect. While we leave the truck stuff to our sister site "Cars Are For Wusses! Cars Are For Wusses! Cars Are For Wusses!" we do occasionally pick on report on what Ford is up to with the F-series. Industry sources say the Super Duty pickups will get a new 6.4-liter V-8 made by Ford's longtime diesel engine supplier, International Truck and Engine Corp. The engine is expected to be launched early next year in Ford's revamped Super Duty F-series trucks, most of which are sold with diesel engines. 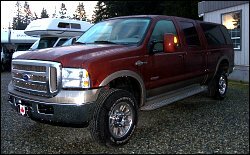 The 6.4-liter replaces a troublesome 6.0-liter diesel, also made by International. That engine has cost Ford millions in warranty repairs and has angered some of the automaker's most loyal customers. Does anyone know if it makes sense to use the same manufacturer that smacked you the first time?